A good bottle is hard to find....I know, we've looked for many many years. These ones are GREAT. These bottles are PET plastic that is BPA free. Flat sided so it hugs the cage or bunny home. Has a precision stainless steel valve and an easy to use spring to attach it to your bunny's home. It holds a generous 33.8 ounces of water to keep bunny hydrated. Instead of the typical ball in a cylinder valve it uses a plunger style valve that your bunny (or guinea pig, etc) activates by biting the end of the valve. While this design tends to be extremely leak free. you should always put a cage-attached bowl beneath the valve because your pet isn't likely to catch every bit of water that comes out when they drink. It is a bit like you trying to drink from a garden hose...some is going to get by you...that's where the bowl comes in. It catches any by-flow. 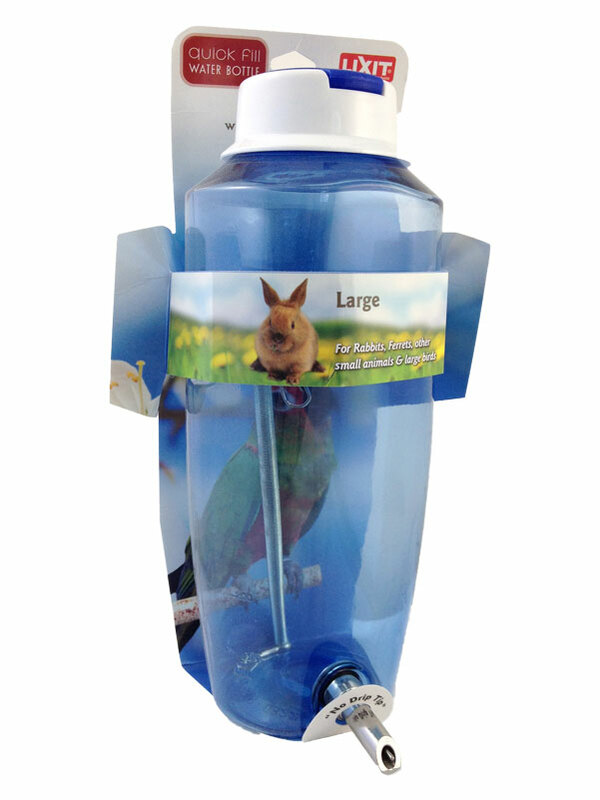 If your bunny or other pet is not familiar with a water bottle, you may have to show them the water by depressing the valve a few times. Most pick it up quite quickly. Hydration is important for all pets (and you too by the way), which is why we use BOTH water bottles and water bowls with all our bunnies. That way they can have as much water as they want and any water that may leak from the valve while they are drinking just drops right into the bowl.